The Pittsburgh Pirates head to Citizens Bank Park on Thursday, July 6, 2017 to take on the Philadelphia Phillies. The expected starting pitchers are Chad Kuhl for the Pirates and Jeremy Hellickson for the Phillies. The odds for this matchup have Pittsburgh at -109 and Philadelphia at -101. The Pirates have a 36-44-4 over/under mark and a 43-41-0 run line record. The Phillies are 42-40-0 against the run line and have a 39-37-6 over/under record. The Pirates have a 38-46 overall record this season. Starting pitcher Chad Kuhl has a 2-6 record with an earned run average of 5.26 and a WHIP of 1.49. He has 62 strikeouts over his 75.1 innings pitched and he's given up 83 hits. He allows 9.9 hits per 9 innings and he has a FIP of 4.33. The bullpen has an earned run average of 4.02 and they have given up 287 base hits on the year. Teams are hitting .253 against the bullpen and they've struck out 264 hitters and walked 105 batters. As a team, Pittsburgh allows 9.4 hits per nine innings while striking out 7.3 batters per nine innings. They are 14th in the league in team earned run average at 4.31. The Pirates pitchers collectively have given up 778 base hits and 358 earned runs. They have allowed 95 home runs this season, ranking them 24th in the league. Pittsburgh as a pitching staff has walked 231 batters and struck out 609. They have walked 2.8 men per 9 innings while striking out 7.3 per 9. They have a team WHIP of 1.35 and their FIP as a unit is 4.23. As a team Pittsburgh is hitting .242, good for 26th in the league. The Pirates hold a .387 team slugging percentage and an on-base percentage of .320, which is good for 20th in baseball. They rank 25th in MLB with 8.2 hits per game. Andrew McCutchen is hitting .282 with an on-base percentage of .370. He has 82 hits this season in 291 at bats with 47 runs batted in. He has a slugging percentage of .495 and an OPS+ of 125. 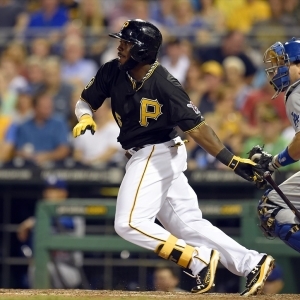 Josh Harrison is hitting .284 this year and he has an on-base percentage of .364. He has totaled 85 hits and he has driven in 27 men in 299 at bats. His OPS+ is 111 while his slugging percentage is at .441. The Pirates have 680 hits, including 133 doubles and 79 home runs. Pittsburgh has walked 286 times so far this season and they have struck out 608 times as a unit. They have left 592 men on base and have a team OPS of .707. They score 4.16 runs per contest and have scored a total of 345 runs this year. Philadelphia has a 28-54 overall mark this year. With an earned run average of 4.48, Jeremy Hellickson has a 5-5 record and a 1.27 WHIP. He has 49 strikeouts over the 96.1 innings he's pitched. He's also given up 95 hits. He allows 8.9 hits per nine innings and his FIP stands at 5.59. The bullpen has an earned run average of 4.64 and they have given up 273 base hits on the year. Teams are hitting .257 against the Phillies bullpen. Their relievers have struck out 256 batters and walked 115 opposing hitters. As a team, Philadelphia allows 9.4 hits per nine innings while striking out 7.5 batters per nine innings. They are 24th in the league in team earned run average at 4.74. The Phillies pitchers as a team have surrendered 751 base knocks and 380 earned runs this season. They have given up 115 home runs this year, which ranks 6th in Major League Baseball. Philadelphia as a staff has walked 269 hitters and struck out 597 batters. They give up a walk 3.4 times per 9 innings while they strike out 7.5 per 9. Their team WHIP is 1.42 while their FIP as a staff is 4.80. As a team, they are batting .243, good for 25th in the league. The Phillies hold a .392 team slugging percentage and an on-base percentage of .305, which is good for 27th in baseball. They rank 23rd in MLB with 8.3 hits per contest. Aaron Altherr comes into this matchup batting .276 with an OBP of .345. He has 70 hits this year along with 41 RBI in 254 AB's. He maintains a slugging percentage of .512 with an OPS+ of 124. Odubel Herrera is hitting .251 this season and he has an OBP of .289. He has collected 77 hits in 307 at bats while driving in 28 runs. He has an OPS+ of 79 and a slugging percentage of .391. The Phillies as a unit have 671 base hits, including 144 doubles and 80 homers. Philadelphia has walked 236 times this year and they have struck out on 695 occasions. They have had 523 men left on base and have an OPS of .697. They have scored 3.9 runs per game and totaled 316 runs this season. Who will win tonight's Pirates/Phillies MLB game against the spread?